Opening the much anticipated safeguarding conference at the Vatican yesterday, Pope Francis said that in light of the “scourge of sexual abuse” perpetrated by clerics “to the great harm of children”, he wanted to consult “Patriarchs, Cardinals, Archbishops, Bishops, and Religious Superiors and Leaders, so that together we might listen to the Holy Spirit and, in docility to his guidance, hear the cry of the little ones who plead for justice”. 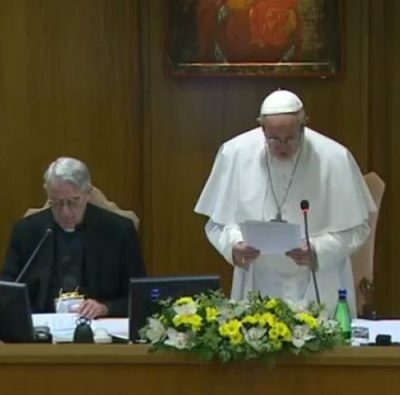 To facilitate this, the Pope immediately presented all the leaders of the Episcopal Conferences present with a sheet of “important criteria” formulated by the various Episcopal Commissions and Conferences to act as guidelines assisting the meeting’s reflection. Twenty-one points included the aim of the meeting: “To draw up a practical handbook specifying the steps to be taken by the authority at all key moments as a case emerges.” It suggests implementing “shared procedures for the examination of accusations; the protection of victims and the right of defence of the accused”; informing civil authorities and higher ecclesiastical authorities; periodically reviewing protocols and establishing specific protocols for the handling of accusations against bishops; accompanying, protecting and caring for the victims, offering them all the necessary support for a complete recovery”; raising the minimum age for marriage to 16 and facilitating the participation of lay experts in investigations concerning sexual abuse or power; laicising priests and bishops guilty of sexual abuse; safeguarding the presumption of innocence until an accused is proved guilty; and introducing rules concerning seminarians and candidates for priesthood, including a psychological evaluation carried out by “accredited experts”. The 19th reflection point is to “formulate mandatory codes of conduct for all clerics, religious, service personnel, and volunteers to delineate appropriate limits in personal relationships.” Explaining the dangers of abuse, and how to recognise and report it, is the subject of paragraph 20. The final point says where it has not occurred “to set up an easily accessible body for victims who want to report crimes”. The body should be autonomous and composed of experts – clergy and laity. Archbishop Eamon Martin, who is Ireland’s representative at the crucial conference, has been appointed the Relator of an English-speaking group. This means he will be reporting back on the discussions of the 17-member group during the plenary session. Cardinal Luis Antonio Tagle addressed the meeting on the need for pastors to know and feel the pain of abuse victims and heal their wounds. He said that the bishops’ lack of response to the suffering of victims, even to the point of rejecting them and covering up the scandal to protect perpetrators and the institution, had “injured our people, leaving a deep wound in our relationship with those we are sent to serve”. Yesterday’s theme was responsibility. Today the conference will turn to accountability and on Saturday the meeting will discuss transparency.